Spain full-back Jordi Alba has committed himself to Barcelona until 2024 by signing a new contract. The 29-year-old's new deal includes a 500m euro (£428m) release clause. 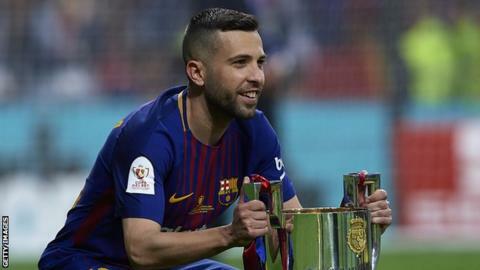 Alba joined the Spanish champions from Valencia in 2012 and has made 282 appearances, winning 14 trophies, including four La Liga titles. He has played 36 games this season for La Liga's current leaders, helping them to the Copa del Rey final and the Champions League last 16.